There are some die-hard composters who compost indoors in the winter using red worms, or set up a full-scale outdoor winter compost operation like The Compost Guy. Although I’m all for composting and reducing waste, I really am not up for keeping worms in the house or building an elaborate winter composting system. So, what I have done is get an early start on the spring compost pile with a very simple method: A Bucket on the Deck. The beauty of my plan is its simplicity. Put a bucket outside the kitchen door on the deck and throw our scraps in there. I only started this about a month ago, but this one small bucket should last us for quite some time. There are only two of us and the scraps compact themselves as they begin to break down. Once we are rid of the snow and the weather starts to warm up, I’ll be transferring our winter collection to the compost pile. That's a pretty neat idea! This would be great for apartment dwellers too who have their own container garden. My parents used to have a compost pile! I'm not much of a gardener. Maybe the secret is in the worms? 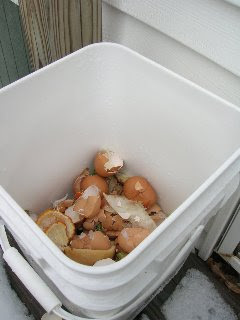 Composting...I have heard so much about it this year, want to try it, but don't know how or where to start! I need a Composting for Dummies book! Visiting from Steals and Deals!